The Laughing Magpie: Red & White Christmas! 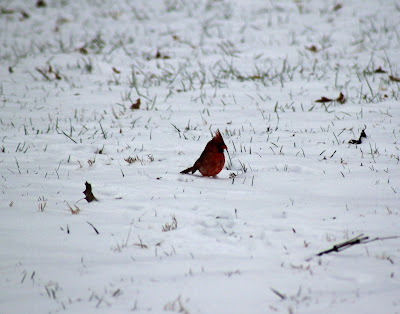 There's about 6 inches of snow on the ground here & it's still snowing off & on! 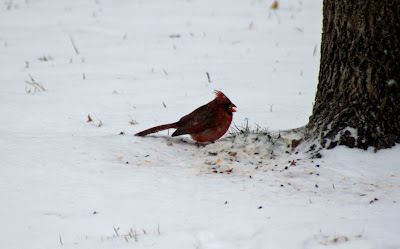 Yesterday we had near blizzard conditions here in Topeka, Kansas! Crazy rain/snow mix for the morning quickly turned to snow by mid-morning & didn't slow down until "sun-up"! the conditions, we made it in 9 hours! 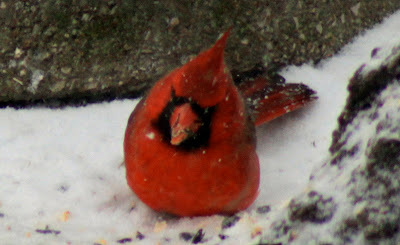 Yesterday I captured these beautiful cardinals pecking at the seed still visible in the snow. 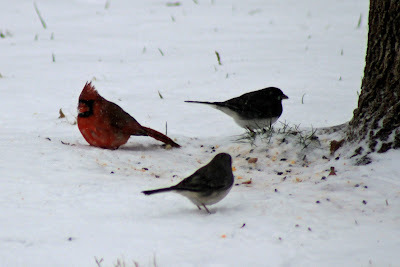 Cardinals just signify Christmas to me! Aren't they gorgeous against the snow! I hope to capture a few more shots today when the sun comes out! We're getting a slow start this morning at my brother-in-laws & Maggie is anxiously awaiting us to get dressed & head to Grandma's to see what Santa has brought for her. We are still waiting for my other brother-in-law to arrive from Utah this evening to finish up the festivities. Although I miss my parents & sister back in Denver terribly, it's nice to be with some form of family & loved ones during the holidays! I wish every one a Very Merry Christmas with loved ones & I'll check in throughout the week from here!